If you are interested in pursuing a career as a rehabilitation counsellor, injury management coordinator or case manager, the rehabilitation counselling major within the Bachelor of Health Sciences degree provides a pathway. Our program gives you a solid understanding of rehabilitation counselling concepts and practices. We offer a comprehensive introduction to rehabilitation counselling and its use within the community. To maximise the development of communication and counselling skills it is advised that you consider taking Sports Counselling and Athlete Welfare as a double major. Please enable Flash or upgrade your browse. Graduates are prepared for roles in case management and with further study injury management including rehabilitation coordinator and rehabilitation counsellor. Your placements can take place in rehabilitation and injury management areas of large employers and insurers, community health centres and rehabilitation services. View College Executive and Administrative staff from the College of Science, Health and Engineering. Our accredited coursework programs offer a comprehensive introduction to rehabilitation and counselling concepts and practices for professionals working in health, education, welfare, and the occupational arena. We prepare you for work with populations characterised by chronic conditions or disability. Focus on client involvement, coordination of services and maintaining individuals in the community. We cover recent developments in rehabilitation at Commonwealth and State level including occupational and community-based rehabilitation systems. As a La Trobe graduate, you may be eligible for our 10% Alumni Advantage when you apply for a full-fee postgraduate coursework program. Entry into the Master of Health Sciences can be gained upon completion of an appropriate undergraduate degree. e.g. Health Science, Psychology, Behavioural Sciences, etc. Prior learning developed through relevant work experience or professional accreditation, where it is deemed to be at least equivalent to that obtained through a Bachelor's degree, may be considered. In making an offer to an applicant, the University will give consideration to a range of factors to determine whether an applicant has demonstrated the capacity to work at a Master's level, including academic record, English proficiency, and/or employment experience. Core subjects relate to areas such as counselling skills (including motivational interviewing), core psychosocial factors that can impact on rehabilitation, case management, vocational rehabilitation, rehabilitation services (e.g. mental health) and a 20-day placement in second semester first year. Watch the video to learn about becoming a Rehabilitation Counsellor from leading experts on La Trobe University's industry panel. 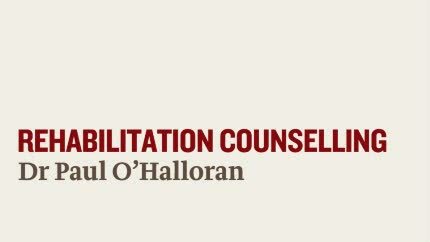 Graduates are prepared to deliver and coordinate client-focused rehabilitation services (e.g. counselling clients) and case manage individuals in rehabilitation settings including community health services, local government, drug and alcohol services, aged care and disability employment services. La Trobe designs its courses with your future career in mind and partners with a range of professional organisations for accreditation and registration. Duration: 1 year full-time or part-time equivalent.